As reports of Zika virus infections continue to spread through the Americas, countless questions loom. Chief among them is about the relationship between infection during pregnancy and microcephaly in babies, which has been difficult to pin down given the limitations of current diagnostics. A number of researchers are working at breakneck speed to develop immunological reagents and assays that could confirm whether a person has had a Zika infection. “We’re trying to do the best we can to give some answers to the clinicians relatively soon,” said Nikos Vasilakis, who is developing Zika tests at the University of Texas Medical Branch in Galveston. 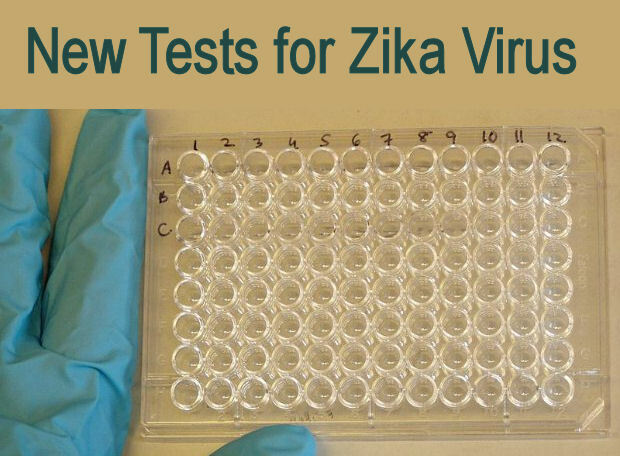 Currently, the standard assay for Zika viral infection is a PCR test that probes for the presence of viral RNA in a sample. While it works well to detect the virus, the pathogen’s RNA is only around for a short period of time. “By the time [patients] make it into the clinic, the virus is likely gone or it’s at the tail end, beyond the limit of detection,” said Vasilakis. What clinicians and epidemiologists would really like is to be able to determine whether a baby was exposed to Zika in utero months earlier. In this situation, scientists at the US Centers for Disease Control and Prevention (CDC) can perform what’s called a plaque-reduction neutralization test, which can pick up on past infections. Essentially, a patient’s serum is mixed with the virus, and technicians watch over several days to see whether the virus can infect a cell culture—if it cannot, the virus has been neutralized by antibodies in the serum, indicating a person had been exposed to Zika. The trouble, explained Ann Powers, chief of the alphavirus laboratory at CDC’s Division of Vector-Borne Diseases, is that “you have to have live virus and appropriate safety conditions,” meaning few labs are able to do the test. More user-friendly serologic tests, which measure the presence of antibodies against a particular pathogen, would be a better alternative, but in the case of Zika it’s been difficult to tell which flavivirus a person has encountered—whether dengue, Zika, or another. “And the problem is, where Zika is occurring is the same place dengue is occurring,” said immunobiologist Mike Diamond of Washington University in St. Louis. Vasilakis is in the process of validating an enzyme-linked immunosorbent assay (ELISA) that could pick up on immunoglobulin M (IgM) antibodies—which can persist in serum for several weeks after an infection—against Zika. Although it may cross-react to some degree with other infections, a higher concentration of Zika-specific antibodies could indicate a recent Zika infection, Vasilakis said.